About a month ago, @RegencyErica approached me on Twitter with this fabulous idea for a romance blog by budding authors like me. Some of us were published (okay, one of us is published), but most of were at various stages of our “journey” in Romancelandia. Of course I immediately said yes. Who wouldn’t want to rub virtual elbows with sassy, fun, smart women in the romance world? You see, I’ve been writing for years. Decades, if I must admit it, but not in romance. I wanted in on it in the worst way because there’s been something missing in my life for a long time: creativity. You know those manuals you got with your off-the-shelf computer software? I probably wrote some of those. Oh and to you professional geeks in the audience, you know all those specifications you say you don’t read but sneak looks at when you first try to figure out a new project? Yeah, I wrote those too. I still do write them for my day job. The job soothes my obsessive-compulsive tendencies, but I’m almost always working within corporate styles or governmental regulations. It can be downright stifling, if you must know. So why do you write romance? Writing romance gives me the chance to play with ideas, to listen to (and respond to) the voices in my head. No one gives me a second look. I’m considered “colorful” instead of obsessive. 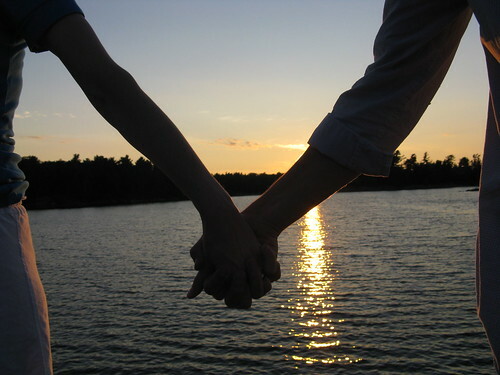 Why romance instead of something like science fiction or history? Because I made a decision a long time ago to choose to be happy, not wait for it to happen to me, and writing romance gives me a happily ever after I can always look forward to. Always. The first romance novel I remember desperately wanting to read was one I’d read an excerpt of in a magazine sitting in a dentist’s waiting room. I couldn’t find the issue after the appointment was over. I left for college not long after that appointment and the story plagued my thoughts. Did the heroine really get auctioned off to a hideous beast of a man or did she end up with the arrogant rake instead? Who was the Night Rider? He certainly couldn’t be the crippled beast in the castle. These questions bedeviled me. 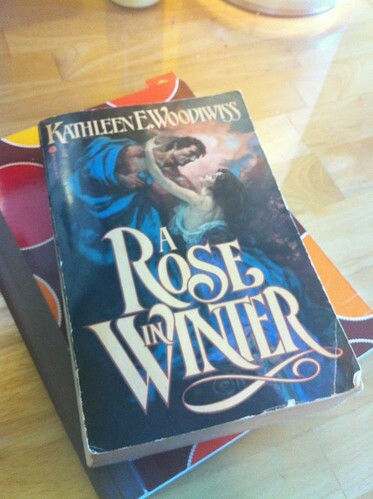 It turns out that book was Kathleen Woodiwiss’s A Rose in Winter. Each time I went into a bookstore I’d haunt the romance section hoping to find the story that saved me when I was thrust into the dental jaws of death. It wasn’t until the end of my sophomore year that I finally found a giant, large format edition of it moldering away, all tattered and worn. I was convinced it had been waiting for me. Coincidently, this was also the first eBook romance I ever purchased. Your house is on fire. Which five romance novels do you grab on your way out? My current work-in-progress, even though it’s this big lumpy warty hairy mess that may never see the light of day. Has anyone else really fallen in love with these (except my WIP, obviously)? I can’t be the only one, can I? Amy and Michael, the Bride and Groom toast the feast guests and thank them for giving up their feast hall to the wedding party. One of my greatest loves is to research the various foods that were served at feasts held prior to the 1600s. I end up finding out everything I can about them, from the exact dishes served and the order they were presented in, to what the head chef wore and the tools they used. 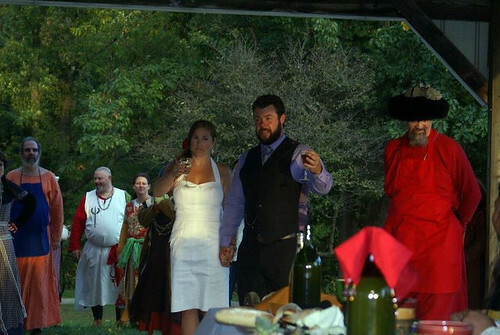 Then I proceed to actually cook those foods for roughly two hundred of my closest medieval re-enactment friends. The last feast I cooked was a four-course dinner from 10th Century Baghdad for 150+ people. It ended up having to be outside because the hall made a mistake and double booked us with a wedding. The bride and groom ended up coming over to our feast and toasting us to say thank you for giving up the hall to them. My next feast will probably focus on medieval Mongolia, but who knows. I can hear the siren song of the sultans of Persia calling me too. Is there anything in your book that comes from personal experience? What is your favorite kind of tea, and how do you drink it? My favorite tea is Ceylon infused with jasmine flowers. I drink it unsweetened, served with oatmeal scones. And so I am not accused of being a food tease, I’ve posted the recipe at the bottom of my first post in my author’s blog, just in case you’d like to make them yourself. Now that we’re all properly introduced, let’s get to know each other. Have a scone, have some tea, and tell me something about you. What are you reading? Do you drink tea while you’re reading it? Janelle, We are so alike! I spend all my days with data and metadata. This includes writing policy, procedure and standards. We are glad to have you join us and look forward to learning more about you. Gods yes. Some days data and metadata follow me through the bldg when I’m in the office. Beastly things. 😉 So happy to be here with such wonderful ladies. It’s going to be a delightful party. And we have scones. What’s not to love? I love Lord of Scoundrels as well. I haven’t read the Dahl or the Ashley, but now they’re on my TBR. And your historic feasts sound so cool! It must take so much research to pull off something like that. Hi Marnee! You can use any type of dried fruit that works for you, if you’d prefer something else. If you’re going to use chocolate chips, I recommend you use the mini one instead of the normal sized. I think the texture works out better overall. Glad I could offer up some choices for your TBR pile. I know some books don’t always suit people, but all these resonated with me for various reasons. I think you might enjoy them. A lot of research? Oh yes. Sometimes even translation of foreign languages. Including dead ones. Oi! Hey Marnee, I heart Lord of Scoundrels so much!!! I’m reading Death Comes to Pemberly now. Somewhat dry but great for Darcy fans!!! And there’s nothing better than a cup of tea and scones in a cozy setting with a good book. Oh, girl. You are NOT alone. LOL! By the bye, I did want to add that I started reading Woodiwiss too. My favorite book is Come Love a Stranger. I even named my oldest daughter after the heroine. Woot! My 1st romance novel was a Woodiwiss too – THE FLAME AND THE FLOWER – I know the pull of the desire to be a writer, it’s been with me since I was 14 even before I read romance but I knew my imagination needed an outlet. I’ve found it in writing romance & my blog. Don’t generally drink anything while reading only writing & then it’s usually Diet Pepsi (caffeine to keep me going) and I just finished up HOW TO BE A PROPER LADY by Katharine Ashe – review coming soon. On to the next on my TBR list – now what did I do with my list? [sigh] The cluttered brain of a writer. LOL! Congrats on the new blog – I’m looking forward to my visits. Pleased to meet you, Amy, and no curtsy is necessary. So happy you could join us! I remember TFatF well. I think A Rose in Winter was my gateway romance. Thanks for the toast too and may you reach your happily ever after. I tend to stay away from soda of all kinds, so I’ll stick to my tea, or perhaps sneak a small cup of coffee with a few other ladies. Would love to read your review! You know, Lord of Scoundrels is on my to-read list. Olivia Kelly recommended it to me and I haven’t gotten through the rest of that series. I personally think you can read Lord of Scoundrels without having to read the others and I don’t say that often. Ms. Chase handles the references to other characters incredibly well, without having them play such a pivotal role. You never feel like your lack of knowledge about another character who has or will have their own book is actually hindering your progression. You never feel like you have to say “okay I don’t get this but I’ll suspend my disbelief for a minute”. You’ve got to read this ASAP! One of, if not THE best, Regencies EVER!! Lord of Scoundrels will definitely be worth your while–it’s actually the only Loretta Chase book I’ve read (so far), but it’s one of my favorites! Great post Jenelle! I enjoyed getting to know you a bit better. I’m currently reading Juliana Gray’s debut A Lady Never Lies set in the Edwardian period. Really enjoyable thus far. You know, I’ve not read or even heard about Juliana Gray’s book. I should go look that up and take a gander. Thanks for the recommendation! Can I just say that I love that you love research? 😀 I’m not alone! And one of these days I’m going to actually write the medieval I’ve been thinking about…know anything about food during the Wars of the Roses? TONS of info on food in that time period. You actually need to narrow it down for me a little from there with a couple of directions you’d like to look in. I have many of the original manuscript translations from various countries during that time period.